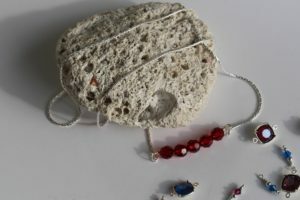 Home A Bead Muse Muses November 2017 Bead Mat Update: Exploring my options! My November 2017 bead mat update, is all over the place! Should I blame the weather, the upcoming season, or admit that I need to play? I am full of creative ideas, but I’m not always organized! 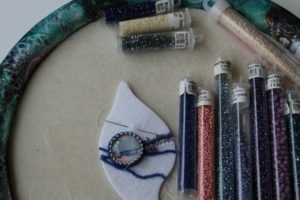 Both Intuitive Bead Embroidery, and Artist Trading Cards (using paper collage, paint, and stamps), are on my November schedule. Is it any wonder that I’m confused? They are very different animals, though both very freeform in nature! This piece is a sample from a previous workshop. I made the cabochon! Is it a landscape, or a seascape? Why is it so organized?? Where is the chaos? 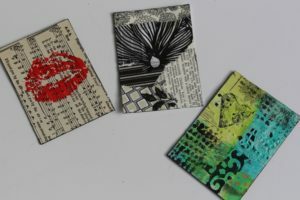 Artist Trading Cards (ATCs) are fast, easy to make, and a whole lot of fun! People trade, hoard, and fondle them! Keep tuned for a BeadFX hosted trade, in 2018! I need to include Swarovski crystals, in my November 2017 bead mat update!! I must get my sparkle on!! 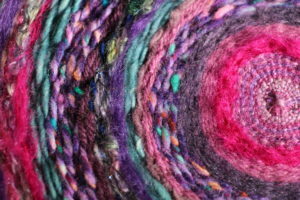 What is a woolly circle weave? Is this a passing fad? Will I get quickly bored? What will I do with it? Does it fit in with my November 2017 bead mat update? 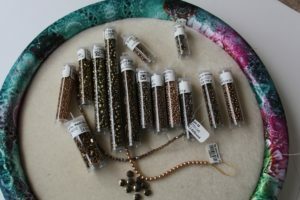 Do I need more bronze beads? This will be a freeform peyote project, but do you think that it needs another accent colour? Black is a given, but is it too obvious? 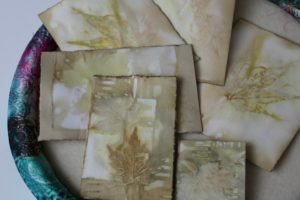 Are you interested in botanical dyeing, because I am! 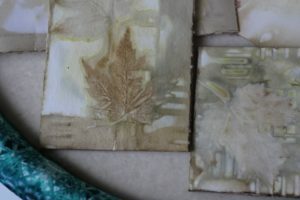 Get a big pot, add leaves, water, paper (watercolour, bristol, and mixed media), copper pipe, and a splash of vinegar, then make some pretty cool prints! Lay the leaves on top of (and between sheets of) paper, sandwich between ceramic tile, tie with string, and then boil for an hour. Amazing results! I belong to an international paper swap, and will include these in future swaps. Do you want to join in the fun? If so, I suggest you check out this link for the Paper Swap Blog! It’s a fabulous experience! I will be busy this month, next month, and certainly into 2018? What about you? Are you curious about what the future will hold? I certainly am!! Classes make great Holiday gifts! Any suggestions? The top I want to wear is embroidered with pinks, aqua & mauves. Lynn, are you wanting to make a bead embroidered flower? If so, then I suggest you either draw, or trace out the shape, and then bead embroider with your choice of colours. Have you bead embroidered before?